This week saw the 70th Birthday of our NHS. Four generations of my family have worked for the NHS so its particularly dear to my heart. I have used it throughout my life – notably when both my daughters were born at the QMC. I fully support Government plans to provide the extra funds the NHS needs and will continue to make the case for more (and integrated) money for social care. Last weekend saw a number of very special events in the constituency – all beautifully organised and a credit to everyone in Broxtowe. I enjoyed them all. This weekend we will all be somewhat consumed by England’s World Cup game against Sweden on Saturday which might just overshadow today’s long meeting of the Cabinet in Chequers. It is at best regrettable that over two years since Leave won the EU Referendum the Government has still not decided what Brexit deal it seeks from the EU. Let’s hope we can celebrate the outcomes of both. P.S And a happy 7th Birthday to Rumbletums Cafe in Kimberley – a wonderful enterprise and a great breakfast! I’m pleased to report our new senior police officer, Inspector Simon Riley is getting a grip on things in Broxtowe. Inspector Riley writes an excellent blog each month which I would encourage you to follow. You can read his latest entry here. 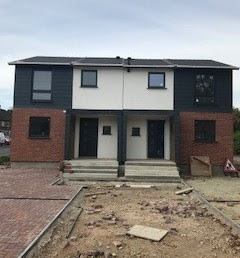 As we all predicted, Advanced Precision Homes owners of the former garages on Redwood Crescent, Beeston, have gone in to liquidation (out of business). It turns out Futures Housing bought the land from them in February and will now take charge of the “development”. Residents are understandably furious. This controversial sale of land owned by Broxtowe Borough Council (i.e. you) should have resulted in new homes and a vastly improved open space for everyone on Redwood Crescent. I am meeting Futures Housing on Monday and residents can be assured their interests will be fully represented and a full report back provided. On Tuesday I had successfully secured a debate in Parliament to raise my concerns that Aldi has failed to keep its promises and build new homes at the same time as a new and much needed store in Stapleford. Unfortunately I was taken ill and the debate was postponed. However, it did prompt Aldi into action – well a letter to the Housing Minister which they have not shared with me. I will speak to the Speaker on Monday to get the debate re-listed by which time Aldi will no doubt see the sense in giving a public commitment to getting on with delivering the much needed homes and supermarket in Stapleford. Sunday marked the centenary of the Chilwell Explosion on July 1st 1918. 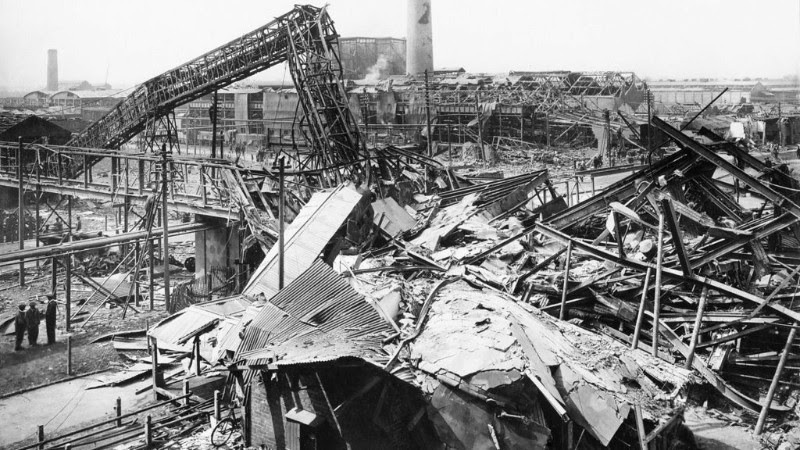 139 people died in the national munitions shell filling factory tragedy which was of such force, house windows shattered two miles away in Beeston. The remains of many of those who died were buried in the church yard at St Mary’s in Attenborough but no memorial was erected for fifty years. 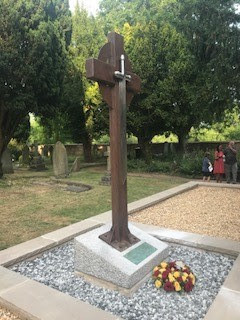 One hundred years on, a new and fitting memorial was dedicated to all who died by the Bishop of Nottingham and Southwell. Our new Mayor Derek Burnett BEM and I joined Nottinghamshire’s Lord Lieutenant Sir John Peace and other dignatories for a remarkable service in St Mary’s. The Rev. Jonathan Smithurst and all his team should be extremely proud that all their had work paid off and a fitting tribute was paid to everyone who died in this most dreadful of tragedies. 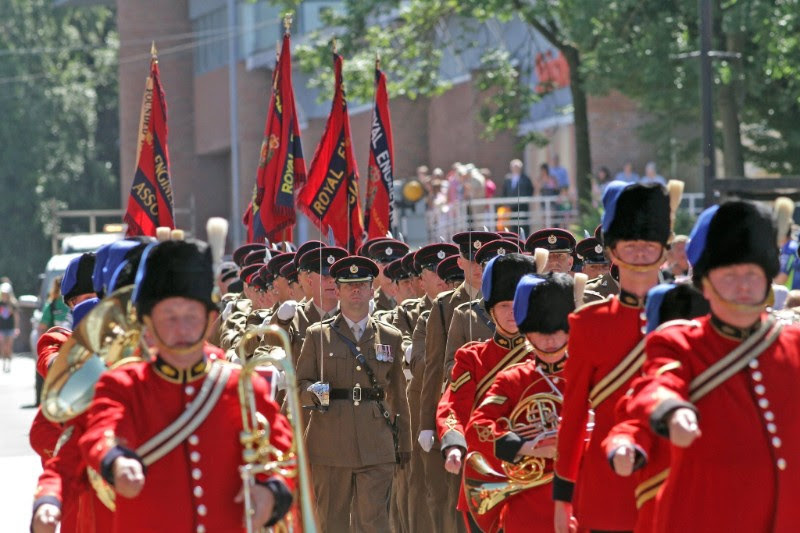 Soldiers from Chetwynd Barracks exercised their right to march through Broxtowe on Saturday. The Freedom Parade was comprised of 170 Engineers Infrastructure Group and Royal Engineer Veterans. There was a good turn out and Hall Om Wong Park was a wonderful sight with its stream of poppies. The event was extremely well organised by Broxtowe Borough and Kimberley Town Council. My thanks to all the organisers (especially for the much needed cold drinks afterwards) and everyone who attended. I thoroughly enjoyed a wonderful combination of a religious service conducted by St Michael’s vicar, Paul Reynolds and a play to commemorate the 15 Bramcote men who died in World War One. 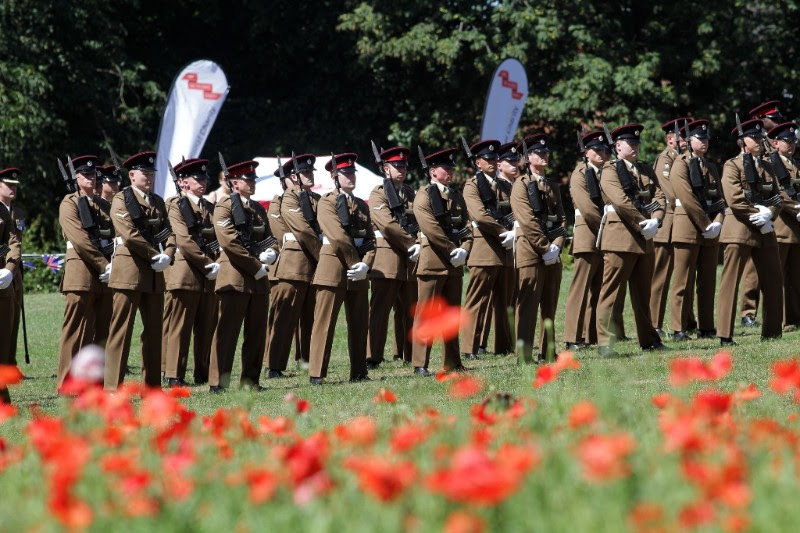 King George V Park in Bramcote on Sunday was the venue for both tributes to the fallen. Pat Ashworth’s play, Beyond the Bluebells, was a triumph telling with compassion, the story of each man and his loved ones. Congratulations to everyone who made the event such a success. I had a very positive meeting with Stagecoach the parent company of East Midlands Trains. The East Midland franchise is out to tender and Stagecoach will be bidding to keep it. I told them my priorities (in no particular order) are a modern fleet of trains that fully meet the needs of all passengers, a fully accessible and improved Beeston Station, car parking at Attenborough station and added some of my own feedback as a regular passenger. Stagecoach have already committed to replacing much of their old rolling stock and will also establish a fund to support voluntary groups such as Friends of Beeston Station. I have signed a cross party letter calling on the Government to stop all future opencast coal mines in England. The upcoming revision of the National Planning Policy Framework provides an opportunity for the Government effectively to ban open casts. Such a reform would also strengthen the Government’s commitments on burning coal and climate change. As you will know I supported residents in campaigning against the opencast site at Shortwood Farm between Cossall and Trowell. It really is time effectively, to ban these dreadful scars on our landscape for a fossil fuel we are rightly going to stop burning.